One of the most well-known commanders of WWII, Erwin Rommel, also known as the Desert Fox, was one of Germany's best leaders. He orchestrated their advances across North Africa, where he got his famous nickname. In Bolt Action, you can have Rommel take over your forces as well. With this update, Warlord Games has posted rules for him. 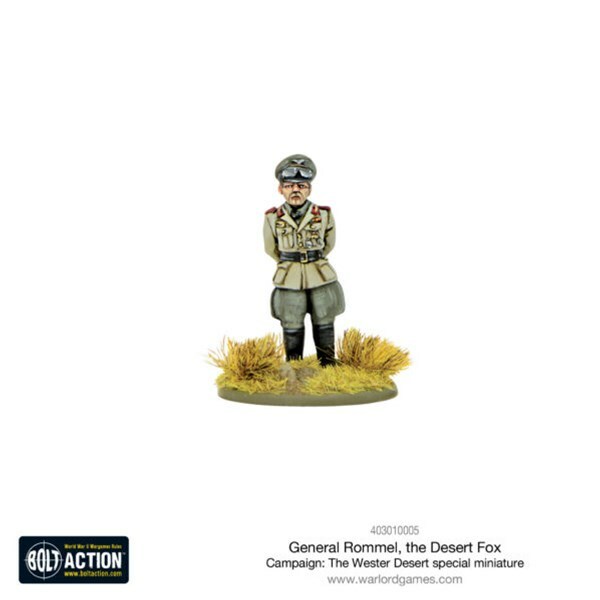 Want some rules for using Erwin Rommel “The Desert Fox” then here you go… Lead your Bolt Action German army into France and the Western Desert, then on to the invasion beaches of Normandy 75 years on! Born on 15 November 1891, Rommel joined the Imperial army at 18. In the First World War, he fought on several fronts and received the Iron Cross and other decorations. He remained with the army postwar, serving the Weimar Republic. Whilst portrayed by many as a ‘good German’ Rommel nevertheless flourished in the new Nazi-created Wehrmacht, even commanding Hitler’s personal army guard the Heer Begleit-Bataillon des Führers. This familiarity with the Fuhrer gave him certain advantages during the Second World War. He was Hitler’s ‘Favourite General’ and got away with acts of insubordination to his seniors that no other general would have been allowed. It was during the battle of France in 1940 that his star truly rose when he commanded the 7th Panzer Division which he handled expertly and due to its rapid movement gained the nickname ‘The Ghost Division’ from its French adversaries. It was therefore only natural when Hitler was looking for a commander for the German forces in Africa that he chose Rommel.